For the first-time since 2001 when the Goodwill Games were staged in Brisbane, Australia will stage a SWATCH-FIVB World Tour as Adelaide will host the world�s best Beach Volleyball players for the first event of the 2008 calendar on world famous Glenelg Beach. The 2008 Adelaide Australia Open will feature men�s and women�s competition starting with country quota matches March 25 and ending March 30 with the finals where the final two teams in both genders will be competing for the gold medal purse and qualifying points for the Beijing 2008 Olympic Games. The last time an international Beach Volleyball event was staged in Australia, Brazilians captured the gold medal at the Goodwill Games, including Ricardo Santos, the SWATCH most outstanding player on the 2007 tour. Ricardo teamed with Jose Loiola to win the Goodwill Games gold medal in September 2001 after Tatiana Minello and Sandra Pires claimed the women�s title for the South American country. Adelaide is the capital and most populous city of the Australian state of South Australia, and is the fifth-largest city in Australia, with a population of over 1.1 million in 2006. It is a coastal city situated on the eastern side of Gulf St. Vincent on the Adelaide Plains, north of the Fleurieu Peninsula, and west of the Mount Lofty Ranges. As South Australia's seat of government and commercial centre, Adelaide is the site of many governmental and financial institutions. Most of these are concentrated in the city centre along the cultural boulevard of North Terrace, King William Street and in various districts of the metropolitan area. Named in honor of Queen Adelaide, the consort of King William IV, Adelaide was founded in 1836 as the planned capital for the only freely-settled British province in Australia. Famous for it's historic past, as well as an array of shopping and dining experiences, Glenelg Beach is linked to the heart of Adelaide by a historic tram from the seaside town with the heart of Adelaide, which is the home of the Australian Institute of Sport Beach Volleyball program'. The most popular and easily accessible of the city�s beaches, Glenelg Beach is immediately south of West Beach, and 11km southwest of the city. 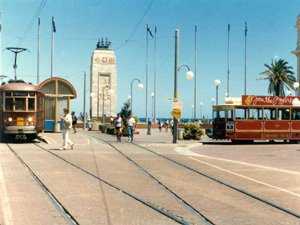 The 30-minute tram ride here from Victoria Square is part of the experience. The tram has its original fittings for 1929 with red leather seats and leather hanging straps and wood-paneled compartments. Glenelg Beach was the site of the landing of Governor John Hindmarsh and the first colonists on Holdfast Bay he read the proclamation at the Old Gum Tree establishing the government of the colony. 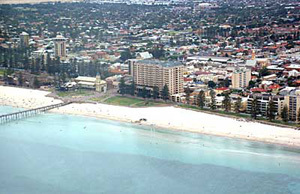 Nowadays, Glenelg Beach is busy year-round. Jetty Road is crowded with places to eat and shop. The tram terminates at Moseley Square where the town hall and clock tower resides. On the opposite corner, the original Victorian Pier Hotel is now part of the imposing seafront Stamford Grand Hotel. 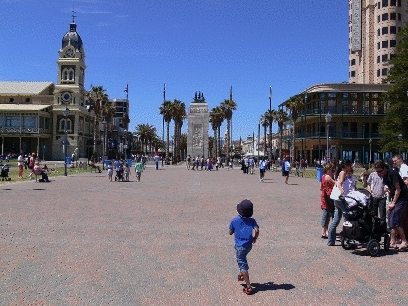 It is crowded on the weekends make Glenelg a vibrant place to be. Australia�s efforts will be led by the teams of Andrew Schacht/Joshua Slack and Tamsin Barnett/Natalie Cook. Both tandems are the top-ranked Aussie teams from the 2007 SWATCH-FIVB World Tour where Schacht and Slack captured the bronze medal at the world championships while Barnett and Cook won an international gold medal in Seoul, Korea. Cook and Kerri Pottharst formed the Australian �Gold Girls� as the pair won the Sydney 2000 Olympic Games by upsetting two-time SWATCH-FIVB World champions Adriana Behar and Shelda Bede in the finals on Bondi Beach to give Aussies only their third international Beach Volleyball medal. While the 33-year Cook is seeking her fourth Olympic trip, Pottharst has retired to coaching while being a �Mum�. Adelaide was the site of the Australian Grand Prix on the Formula One circuit (1985-1995) before the international car race move to Melbourne. Since then, Adelaide has been staging the Clipsal 500 V8 Supercar race event on a modified version of the same Formula One street circuit. Adelaide has hosted the annual Tour Down Under bicycle race since 1999 and the Bay to Birdwood run featuring vintage and veteran cars from around the world. Glenelg Beach has been hosting domestic Beach Volleyball events since 2001.